The cultivation, commerce, and export of dried or fresh figs was controlled by the state in ancient Athens and brought in large profits. The fact that figs are a seasonal product that cannot be preserved for long periods of time encouraged people to seek out ways they could enjoy this product all year round. This is how the fig marmalade came into existence, which boasts a very long shelf life. Figs herald the end of the summer, as they ripen mainly in August. Nothing can compare to the taste of a freshly picked fig from the village fig tree in the morning. The most famous varieties are the “royal” black and the white figs and for good reason. Delicious! Rince fruit thoroughly and do not peel. Select ripe, but firm figs. Remove stalks with a sharp knife and halve, or quarter if big. Rinse plums, halve and remove pit. Place the fruit in a wide pot with a thick base. The next day, bring to a boil on a medium heat. Skim off any foam if necessary. The marmalade is ready when a thick layer sticks to the back of a spoon. Towards the end, add the lemon juice and bring to boil one more time. Divide the warm marmalade between the sterilized jars and fill to the top. Seal with the sterilized lids and turn upside down on the kitchen counter. When cool, store in the cupboard. Flavor marmalade with clove, cinnamon or scented geranium. I prefer it plain. 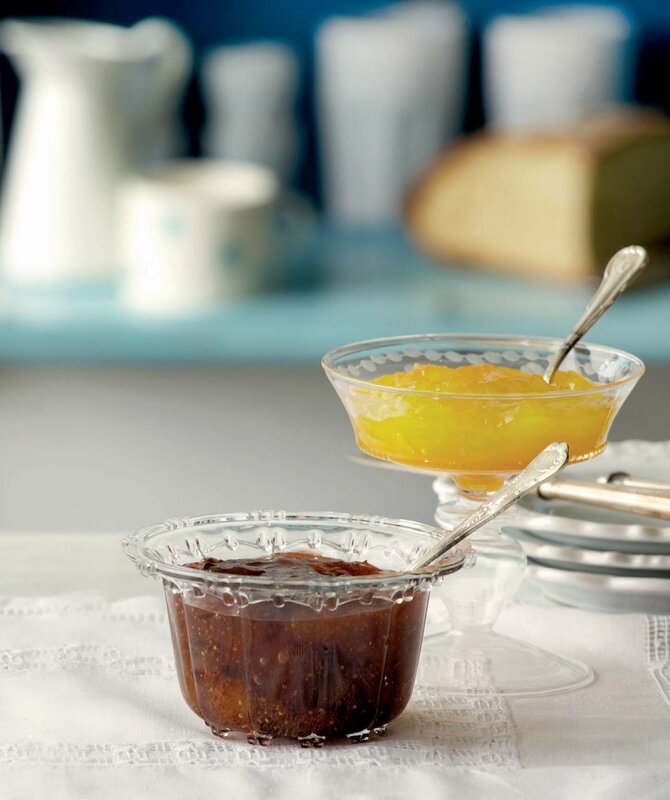 Using plums and quetsch plums will give the marmalade a deep red color while using apples makes it lighter.